Today I will publish the diagrams and text for the second three: Vegetation & Wildlife, Microclimates, and Buildings & Infrastructure. Looking at Lillklobb at the site scale for vegetation and wildlife reveals some interesting patterns. 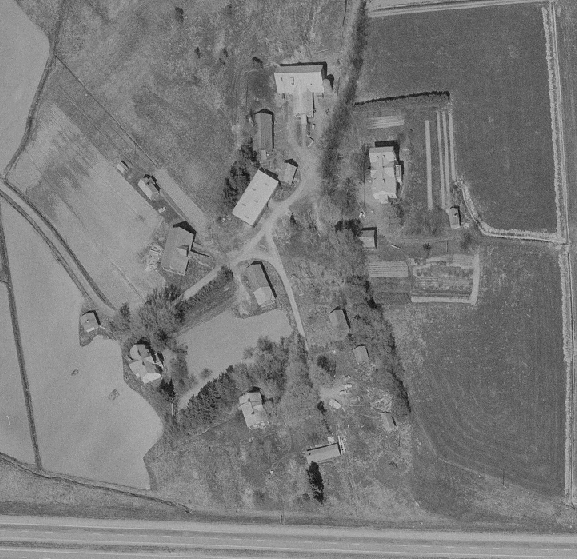 Since I am approaching the site with the intention of returning the land to primary production, I’ve decided to also include an aerial photograph of the location from 1970 (from Espoo Map Service, copyright by BLOM). 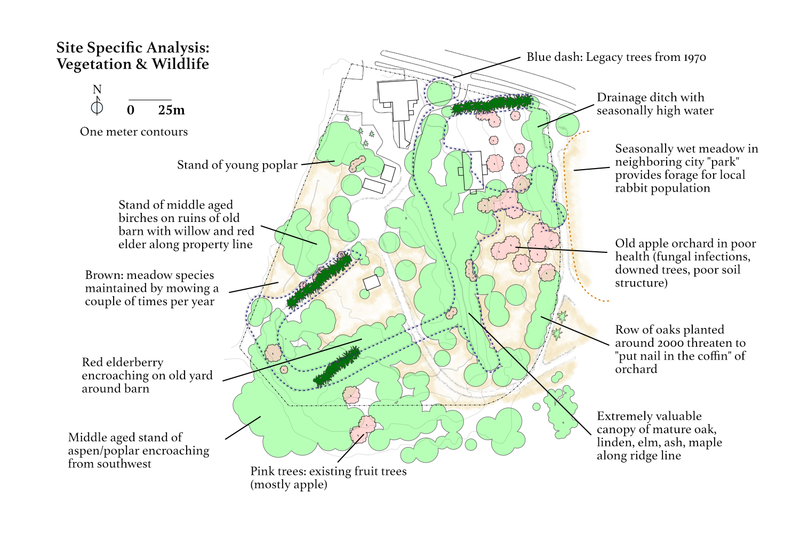 This photograph clearly depicts how the intervening 45 years have altered the site’s development in terms of vegetation and wildlife distribution. I’ve overlaid the trees and shrubs which were extant in 1970 on the analysis map as “legacy trees from 1970.” It is evident that shift from agricultural use to cultural use has led to a large increase in the number of trees on site and diminishing of open spaces. These legacy trees include an unmistakable line of oak, elm, ash, and linden trees which more or less bisect the property from north to south along the ridge line, the lilac hedgerow that extends from the main ridge southwest, the spruce hedgerows in that southwestern district, and all of the fruit and berries species on site. These existing trees became the vector from which the woodland began to expand through the site, though the extreme southwestern corner’s even-aged stand of poplar probably began expanding from the small stream that runs outside the property. Lillklobb’s current ecosystem, then, is comprised of an admixture of legacy ornamental and rare species and early pioneer species. Those pioneers include birches and elderberries, along with maples. Since “release” from the hand of the farmers, the offspring of the legacy trees have overtaken the understory and are in a classic state of undergrowth suppression by the mature trees and colonization of the edges by pioneers. Together, this quite diverse species mixture has created an ecosystem that can be described as aggrading woodland. The number of nesting bird species is quite high as, although the woodland has expanded in size, the city maintains a fair amount of space as “meadow.” These meadows are mowed infrequently, but enough to keep them from becoming wooded. This leads to a high amount of edge, which wooded areas interweaving relatively open space with both very tall, mature hardwoods dominating the ridge and many shrubs and younger trees along those edges. With such a diversity of habitat, the potential for finding food and shelter is increased. Rabbits are perhaps the most conspicuous herbivore on the property and there is a thriving squirrel population as well due to the number of mature oaks. There are reports of intermittent deer visitation as well, which would make sense too given the location’s situation along a greenway replete with streams. These streams, depicted in the neighborhood analysis in part 1, provide fresh water to the birds and other wildlife on the property. If we turn to the meadow plant species themselves, there is quite a diversity with many useful species on site such as nettles, ground elder, and raspberries throughout the place. The old apple orchard is perhaps the place displaying the least amount of vegetative health: many of the trees are beset with fungal infections, have many broken branches, and some of the trees are actually laying horizontally on the ground in their last stages of health. There exists severe compaction around some of the trees as well as a significant “pit” like pattern that fills with water from late autumn through early spring. Additionally, the trees are under threat by the oaks planted along the southwestern corner of the property (technically in Lillklobb Park, not in Lillklobb itself, see the Zones of Use section coming later for more). When those oak trees reach maturity, they will cast shade throughout the old orchard, effectively killing the apples (should they survive that long). The old apples within the yard itself are facing similar issues in regards to access to sunlight, but they have better drained soil and have been maintained more regularly. 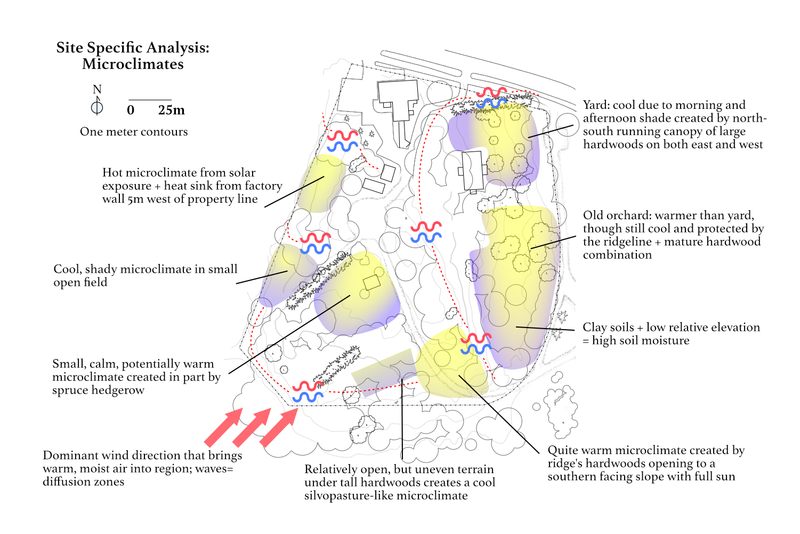 For this analysis, I’ve chosen to only analyze the microclimates of the relatively open spaces on the property. The areas with canopies of mature trees are quite similar to one another, being shady, cool, and well watered. Starting from the top and working clockwise, the yard of the main house. This area is rather cool and semi shady, with only the northern easternmost section receiving what could be considered full sun throughout the growing season. Tall willows and poplars line half of the drainage ditch to the east, with two very large elms and one oak rounding out the southern part of the drainage ditch- casting quite the shade in the property. Still, there is a southern and southwestern gap which allows in light for partial sun and fair fruit ripening on the old apples that are there. Since the property faces east and slopes slightly downward in that direction, the tall house and trees along the hill’s ridge prevent the area from receiving evening light. Like most place on the property, this particular microclimate is quite protected from the wind and has a strong windbreak to the north consisting of 20+m tall spruce. The dark color of the spruce may also create a warm band along their southern edge during summer. Cold air is free to drain into the ditch and settle there. That ditch also “unzips” soil moisture and keeps the high clay content ground better drained than to the south. Going south out of the fenced yard and into the old orchard, the microclimate is very similar. It is slightly warmer as the oaks to the southeast along the vehicle track aren’t fully grown yet, so the northern section gets full sun. However, three large willows dominate the skyline during mid day and shade the orchard during spring and autumn, which contributes to the poor health of about half the orchard. The topography of this area does not allow for a beneficial frost pocket to form, at the same time, however the air can move quite freely. The dominant winds from the southwest are blocked almost in total by the ridge line and canopy of mature trees, making this area calm on most days. With clay soil like the previous microclimate, but without a drainage ditch or steep slope, soil moisture here is much higher. The old orchard has a few pits that accumulate water late in the autumn and hold it through spring. The warmest microclimate on the property is at the southern tip of the ridge where the ash and maples along that ridge continue to the southeast and the maples/lilacs which separated two of the farms continue westward. This meadow slopes slightly southward and thus the wings created by the trees create a solar bowl. The strong growth of grasses and raspberries attest to this area’s warmer than average character. Water freely drains here as it sits two to three meters higher than high water levels. Just to the west of this section, things change as the meadow is more like a giant partial shade ground elder and nettle patch, pock marked by ruins of old buildings. A few very large oak, maple, and birches stand here with conversion to total forest being prevented by mowing. Currently it may be too shady to support grass based pasture, but it has potential. Soil moisture is high due to the forest cover. On the northern side of the lilacs and maples, the area around the barn is a very still, potentially warm microclimate. The hedgerow of spruce, which has not been maintained at a short height, prevents this space from getting full sun, but does hold a lot of warm air. Undergrowth is not too thick, so cold air flows down the hill and into the woods from the open area. This site appears free draining, though there are little signs of a lack of moisture, even with the high sand content. West of that is a strange piece of meadow that must be mowed regularly as it has not yet been converted to forest. It is very shady, due to those spruce, but could become very warm if they were removed. The “cut” for the factories allows cold air to spill down and away very well. Soil moisture is higher than the previous microclimate because of the shade, even with the sand. Jumping north across the stand of birch that grows on the old barn ruins is the second warmest microclimate on the property. With the summit of the hill to the east, with its young oak and maples, a stand of very young poplar to the north, and the factories to the west means that this area is also a west facing solar bowl. The concrete walls of the factory act as heat sinks, radiating warmth back out into this microclimate. Like the previous microclimate, cold air can drop off the “cut” and pool there, not on the field. Soil moisture is sufficient to support a thick meadow, even with very sandy soil. Lastly, I’ve included the dominant wind direction with diffusion zones created by trees and physical features. 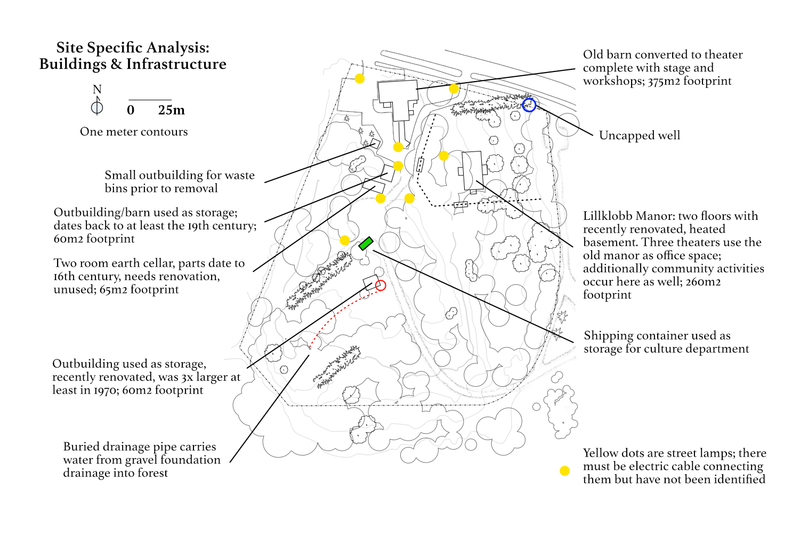 Lillklobb has five buildings, one outbuilding, and a storage container, with other built infrastructure all clustered in the north, besides the shipping container and a barn. With over 500 years of recorded history, Lillklobb also has the remains of many other buildings including houses, barns, and outbuildings scattered throughout the site. I won’t focus on those here, but rather in the Current Zones of Use section. An old stone barn was converted to a theater over 30 years ago when the property was acquired by the city of Espoo. It houses the theater in almost its entirety with the bottom level being dedicated to the workshops of theater staff. The main floor houses the performance area. The barn’s immediate footprint is about 375m2 and its roof is divided into 5 faces. Lillklobb Manor is a two storied wooden house built in 1892 and is a little smaller than the barn at 260m2 footprint; its roof also has 5 faces. I refer to this building as the main house, old manor, or simply as Lillklobb (for varieties sake). It houses the offices of three theaters and serves as my office as well. Lillklobb has a recently renovated basement complete with lights and heating. The basement has two main rooms along with the old food cellar and significant “hall” space. This is where most of the water and electric infrastructure is placed, with large door access from the east and south (along with a narrow interior stair). The first floor is quite large, with the stairway to both upstairs and the basement inside after an entry room. There are six “small” rooms devoted to one thing or another with a main “hall” centrally located in the back. A modern bathroom and kitchen are in the southwest corner. A very narrow stair connects the kitchen to the upstairs as well. Upstairs has a modern toilet and kitchenette with three “large” (very large relative to most Finnish spaces) rooms serving as office space. A balcony that gives views to the eastern yard and old orchard is here as well. The building is in fair condition, with a new roof installed in the 2000s. Since Lillklobb is surrounded by the yard and has a lot of garden space, its rainwater is more easily put to direct use. If we head to the southwestern portion of the property, but still near the center, we find an old wooden barn/outbuilding. It was recently renovated with a new foundation with significant drainage, including a buried pipe with pulls excess water in and to the southwest. It is only slightly buried and one can find its route quite easily; it terminates at the forest edge. This barn is about 60m2 and has a partial loft. Currently it serves as storage for one of the theaters. It is very easy to access by both car and foot, making it an ideal place for basing farming activities. It lacks water and electricity at the moment. North of this barn is a shipping container owned by the city of Espoo and used as storage. It does not sit in an ideal location and could be moved, further put to use for a lean-to greenhouse or even for accentuate gravity fed water irrigation by holding water storage containers on its roof. Across the circular parking lot is a 65m2 footprint earth cellar. It is primarily constructed out of large granite boulders and has two rooms. The back, main storage room is larger and measures about 17m2 internally, with a uncovered air vent in the middle. This air vent and the roof were recently renovated as well, though no improvements seem to be made inside. The back room has a small hatch on the far western wall which allows for airing out and, one ventures, emergency exit. The smaller first chamber is separated from the second by double doors which no longer close completely. It measures 8m2 and hosts the main door, which also does not close correctly and gives way to narrow steps down to the floor. Both rooms have about 200-220cm to the ceiling in the middle, with the roof boulders being arched. The cellar is currently not well ventilated and has large build up of mold and fungus, with tree roots sporting some variety of reishi mushroom in one corner of the main storage room. There is not electricity or water. With attention to the interior, this earth cellar could be an exceptional asset to the farm for both storage, perhaps solar panel roofing, and rainwater capture directed to the western fields. It should also be preserved as portions of it are some of the oldest known on the site; renovations are said to have uncovered bricks stamped to the 16th century. Immediately next to the earth cellar is another barn of similar size and style to the one previously described at 60m2 footprint. It is also used for storage. Lastly, a small modern outbuilding sits along the parking lot and is used for waste bins. Its roof is small and probably wouldn’t be used for storage, but could be redirected with more intention. I’ve also included the well one more time here since it is a significant built feature on the property, although we have little information on its capacity. As a public space, the city of Espoo has put up street lamps around the main access routes to the property. They are on automatic timers and their light is directed mostly downward. The presence of the street light on the southern end of the summit parking means that there must be a buried electric cable there somewhere, though I don’t have the maps for that yet. Inside the yard are also a small number of light installations which shift color from purple to blue at night, lighting up the trees. These also have electric cables which need to be identified. The western section of the main house’s yard also has a number of park tables and benches which allow for outdoor gatherings.